and they said, “Is this not Joseph’s son?” 23 And he said to them, “Doubtless you will quote to me this proverb, `Physician, heal yourself; what we have heard you did at Caper’na–um, do here also in your own country.’” 24 And he said, “Truly, I say to you, no prophet is acceptable in his own country. 25 But in truth, I tell you, there were many widows in Israel in the days of Eli’jah, when the heaven was shut up three years and six months, when there came a great famine over all the land; 26 and Eli’jah was sent to none of them but only to Zar’ephath, in the land of Sidon, to a woman who was a widow. 28 When they heard this, all in the synagogue were filled with wrath. 29 And they rose up and put him out of the city, and led him to the brow of the hill on which their city was built, that they might throw him down headlong. 30 But passing through the midst of them he went away. “Today” is a very special word for Luke. It does not refer to the particular day or date when Jesus spoke in the synagogue. It refers to the time of fulfilment of the promises made by God regarding the future Messiah. Jesus says that “today”, in this era, the era between the first and the second coming of Jesus, in me, those promises are being fulfilled. These promises are not being fulfilled in a once–and–no–more occasion; they are continuing in an era, this the final era of the world. 22 All spoke well of him and were amazed at the gracious words that came from his mouth. All spoke well of him and were amazed at the gracious words that came from his mouth. They said, “Is not this Joseph’s son?” — The people were very pleased with Jesus’ inaugural presentation. “Is not this Joseph’s son?” — The people were very enthusiastic about Jesus’ words and his comments on Isaiah. Then remarks were made, ‘How could Jesus be the Messiah and he is nothing more than carpenter Joseph’s son?’ Opposition began to appear. It seems strange that there should be such adulation at one moment and in the next such adverse criticism. This is explained by the first and second remarks recording two different episodes. There was a time element between the two comments and the second one about Jesus being Joseph the carpenter’s son took place sometime at a later date than the first which elicited exultation and approval. Obviously the people in the synagogue did not know about Jesus conception through the working of the Holy Spirit (Lk. 1: 34–35; 3: 23). “And he said to them, ‘Doubtless you will quote to me this proverb, “Physician, heal yourself; what we have heard you did at Caper’na–um, do here also in your own country.’” — The proverb means that the physician should heal himself and his own people first, rather than go elsewhere. The people had heard that Jesus had worked some miracles and cures in Capernaum; they wanted those performed in Nazareth. Indeed they did not want him looking after any others but themselves. “And he said, ‘Truly, I say to you, no prophet is acceptable in his own country’” — Jesus replies to the adverse criticism. He says that prophets who proclaim God’s message faithfully are not accepted by the prophet’s own people. The people were demanding. There is always the danger that people are demanding where God is concerned. Here they expected signs for their own benefit. What Jesus expects from people is faith in his word, the word of God. “But in truth, I tell you, there were many widows in Israel in the days of Eli’jah, when the heaven was shut up three years and six months, when there came a great famine over all the land; and Eli’jah was sent to none of them but only to Zar’ephath, in the land of Sidon, to a woman who was a widow” — Verses 25 to 27 appear to be a third visit of Jesus to the synagogue in Nazareth. Jesus places himself on an equal footing with Elijah. He says that Elijah helped a Gentile widow before helping the Israelites when there was no rain and great famine in the country (I Kgs. 17: 1–16). Jesus implies that he will go to the Gentiles also. “heaven was shut up three years and six months” — There was no rain for six months but Luke adds six months because three and a half years was the Biblical manner in speaking of the time of persecution (Dn. 7: 25; 12: 7; Rv. 11: 2; 12: 6, 14)..
“And there were many lepers in Israel in the time of the prophet Eli’sha; and none of them was cleansed, but only Na’aman the Syrian.” — A second prophet, Elisha, is introduced as one who also went to help the Gentiles and did not help the Israelites who were suffering like from leprosy like Naaman (II Kgs. 5: 1–14). “When they heard this, all in the synagogue were filled with wrath” — The people in the synagogue were angry because Jesus told them that the Gentiles would be the recipients of God’s favours and graces and the Jews would not be specially accepted. “And they rose up and put him out of the city, and led him to the brow of the hill on which their city was built, that they might throw him down headlong. But passing through the midst of them he went away” — It is accepted that Jesus did not work a miracle here but that no one had the courage to push him over the brow of the hill on which Nazareth was built. He turned around, walked through their midst and went off. 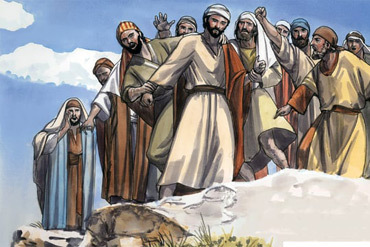 “he went away” — The people had rejected Jesus. He left Nazareth and is not mentioned as having returned there ever. 1. Chapters One and Two in Luke’s Gospel tell of incidents in the very early days of Jesus’ life, referred to as the Infancy Narratives. Chapter Three records his baptism and temptation in the wilderness, the preparation for his public ministry. Chapter Four commences his public ministry in Galilee with a visit to his home–town of Nazareth. In the synagogue he proclaims that he is the promised Messiah. The people are more than pleased with his teaching until that point when he declares that he is the Messiah. How could a small–town boy like Jesus be the Messiah? He was much too ordinary. Jesus answers their objections. He emphasises that he is a prophet–Messiah. The “Messiah” means the anointed one and Jesus proclaims that he is anointed as a prophet to bring them the word of God. The people will not accept his word and demand a sign and he gives them the example of two prophets as a sign. He compares himself to Elijah and Elisha. They did something which he would do. They did not confine their prophecy and ministry to Jews; they went out to non–Jews, the Gentiles. That really provoked the people. They regarded themselves as God’s Chosen and no other people were even considered. God would never by–pass them. Jews, and only Jews, were special to God, so they thought. The people of Nazareth were so incensed they prepared to kill their fellow townsman. His only ‘crime’: he was too much like themselves and they knew his family; in addition he was prepared to respect and assist the Gentiles; finally, he claimed to be a prophetic Messiah. Simeon had foretold this reaction several years earlier in the Temple when Mary and Joseph brought Jesus there to be presented. “Simeon blessed them and said to Mary his mother, “Behold, this child is set for the fall and rising of many in Israel, and for a sign that is spoken against”. 2. Luke has another reason for opening the public ministry of Jesus with his triple visit to the synagogue in Nazareth. Look at what happened. Before visiting Nazareth he went around Galilee and was welcomed with adulation. People accepted him and were delighted at his message. Then he went to Nazareth and there he was accepted until he claimed to be the Messiah. From that moment onwards the people sought one reason after another to reject him. Their anger at his claims got so intense they attempted to kill him. Only by God touching their hearts was he able to walk away and leave them in their stubbornness. For Luke this is the pattern of Jesus’ life. He will go around his native land and be accepted by the Gentiles while rejected by the Jews. The hostility will grow until they succeed in putting his to death on the cross. 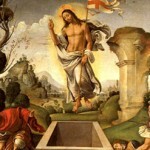 But again his Father will intervene and he will rise and ‘walk’ away from them in the resurrection and ascansion. This is a pattern to be presented by Luke throughout his Gospel. He is alerting his readers in this early chapter to be aware of the pattern as it appears.